Here at Camp Quinebarge, we embrace the outdoors. Campers spend all day playing and learning outdoors – on the lake, in our Nature Center, or simply throughout camp! One of our longest-standing outdoor programs is hiking. We offer hiking trips every day, along with off-site camping and canoeing every session. 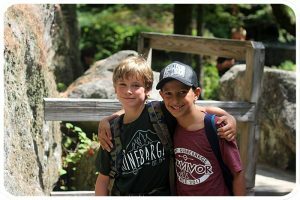 Our summer camp hiking program is among our most popular, with nearly every camper participating in a hike or two throughout the summer. Adventure means different things to different people. Some kids are thrilled and challenged by a slight incline and 30 minute hike, while others think of 4,000-footers as ‘easy’. We offer a broad range of hiking opportunities, for hikers of all experience levels! Our hikes start with easy summits like West Rattlesnake, all the way up to Mount Washington – the tallest mountain in the eastern United States. Each trip is voluntary, with campers signing up for as many hikes as they like. Trip leaders keep track of miles hiked, and the most avid hikers aspire to the 100 Mile Club. 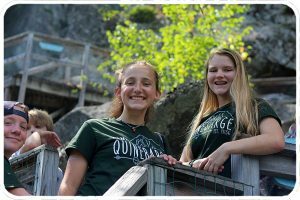 Our experienced, qualified trips leaders make sure that campers are choosing hikes within their level of ability, and work with our Directors and Camp Nurse to ensure camper safety while on the trail. As with most things, we find that our hiking program is more fun when you have a friend to walk beside. Counselors are trained to foster friendship, and shared experiences and challenges – including our hiking program – deepen those bonds even further. Friendships begin on the first day, and grow stronger with each activity, campfire, and hike. 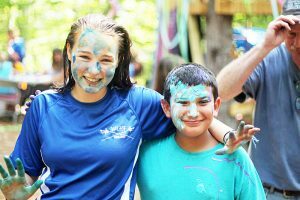 Whether campers come for a session or the full summer, they will go home with fond memories of camp fun and summit views, and friendships that will last a lifetime.